Menja Stevenson’s Bustour Series Utilize Transit Fabrics for Art and Observation « Adafruit Industries – Makers, hackers, artists, designers and engineers! With her 2008 performance in the Stuttgart bus network performance “Bus Tour S” Menja Stevenson proves impressively that humor and social criticism must not be mutually exclusive. The hair disciplined parted, with a slightly bored expression, now and then dreamily looking out the window, hands in the lap or on the back of the front seat, the artist has inconspicuously in the stream of lemmings, average citizens on the way to work, shopping and to the employment office, queued. 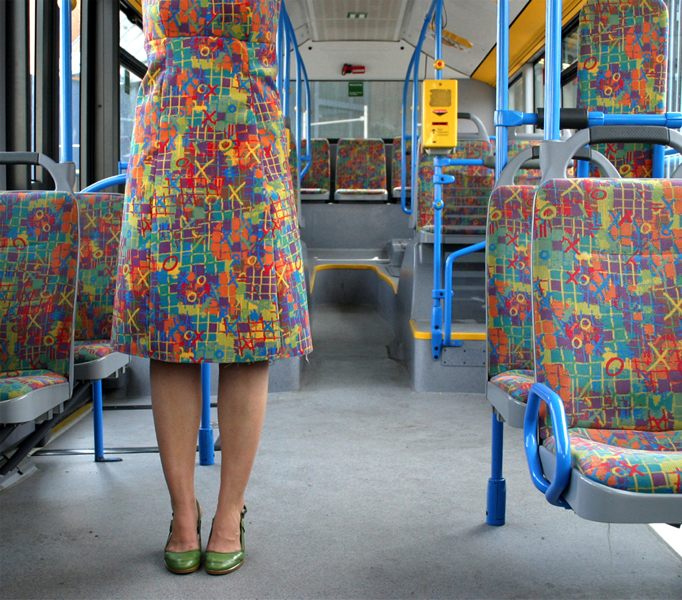 Only her business costume is conspicuously inconspicuous, because it – like her handbag – made of the same velvety, coated with geometric Op-Art elements colored fabric like all seats in the bus. An older lady is irritated, almost amused, but the majority of passengers do not seem to register Menja Stevenson’s performance. The ritual of everyday life wins.